The 1827 Musters are not a record of every ship in and out of the English port of Liverpool. They are a record of ships and their crews for whom musters were lodged at the port of Liverpool in 1827. To understand why this collection of records was created, see Liverpool Ships Musters 1772 – 1850. 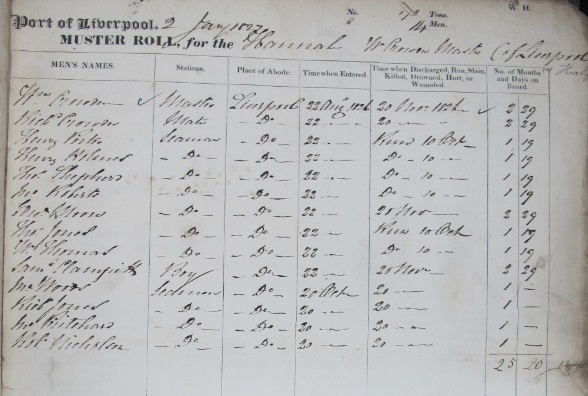 When ships arrived in Liverpool their master, owner or agent was obliged by law to submit a muster of the ship’s crew along with details about her voyage. 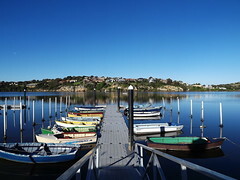 Some ship’s owners and masters thought they had reason not to submit their musters, so their ship’s muster might be found in later years or not at all. Small coastal vessels rarely make these musters so were probably exempt by their tonnage and occupation. Within these 1827 musters are details about ships’ voyages usually for the years 1825 to 1827. However there are records of voyages as early as 1804. For example in November of 1827, Ellen Rigby submitted musters for the Glory, 58t for the years 1804-1810. This vessel had been in the ‘transport service’ on the ‘Coast of Ireland’ during that time, and the list of crew was only submitted in 1827 by Rigby, who was the daughter of Richard Cartwright, probably the ship’s owner or agent. Ship’s masters, their owners or agents were the men who were supposed to submit a ship’s muster. Typically the muster document will record the ship’s name and tonnage and from where she had voyaged. Some voyages are quite detailed as to how many ports were sailed in and out of, others will simply indicate the last major port = eg “Africa”, “Demerara” “Jamaica” etc. Each Muster is usually one page in length and is sometimes accompanied by a ‘declaration’,which is basically a statement by the master/owner/agent saying the details being submitted were correct. Declarations can be on the actual muster itself, or attached as an addendum. Musters and declarations were bundled, and bound in a register at some point in time but it is not known if was at the end of each year or in later years this was done. Each Muster usually contains the date the Muster was filed, the name of the vessel and her master, and from where the ship came. The exceptions being when make is included (bark, snow, sloop etc) and tonnage, if she belonged to Liverpool and if it was a “return” trip. Each muster is allocated a number, in handwriting and are usually filed in sequential order. However there appears to be documents missing and in 1827 those allocated the numbers #51, #74, #250, #419 and #566 are missing along with ten mustersnumbered 370 – 379. Document numbers are sometimes allocated twice (to different ships) and in this year are #24 (Matilda, and the Favorite), #298 (Elizabeth, & Robert Burns). Out of chronological order are #80 & #79 (Crown & Thomas Dempsey). One document placed between #280 and #281 has no number, and about a third of this document is torn. The name Henry or Henry Arn or Henry & Son can just be deciphered, and is possibly her voyage was made in 1826. The final document in this file is a torn scrap which has the ship’s name as Othello and the year looks like 1882, so definitely not belonging to the year 1827. Except for home-ports trades these Musters typically record one voyage only and do not usually include details of every port visited in between. So generally speaking, the major port of departure is the only one listed. For example if a vessel sailed from Liverpool for Africa,and then returned to Liverpool, the Muster will show Africa as the main port in the voyage details. 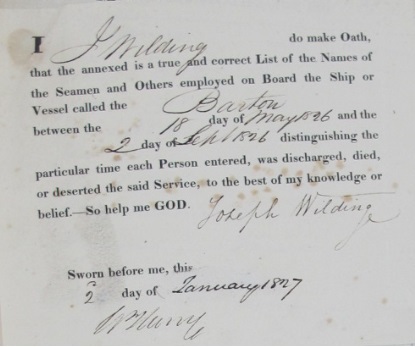 The captain, agent or owner of the vessel usually signed a Muster which also records the name of each of the men, their “station” (Mate, Boatswain, Seaman, etc), their Abode, and dates when they ‘signed on’ and were ‘discharged’. 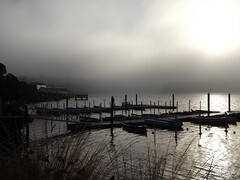 Later year’s musters might include the former ships of service, or native place, though this does not seem consistent. It is usually recorded by date and place when any of the men Deserted (Ran/Run), Died, were Impressed (taken from the ship) for service in the Royal Navy, or if they were left at a port due to poor health. If impressed, the name of the Royal Navy ship is also commonly recorded. Sometimes there is a notation (written in later years) indicating that seaman achieved further certification (i.e. he obtained a higher rank, such as Boatswain, Engineer, Mate, and Master). These notations are written in a different hand and ink, and usually the man’s name also will have a ‘tick’ next to their name, indicating someone was checking back on earlier records, probably to confirm a seaman’s prior service. For 1827 there are 597 musters for ships arriving at Liverpool in this, and earlier years reflecting 145,192 tons of vessel movement. However some ship’s tonnage was not stated and there are voyages for other years contained in this figure. The busiest month for muster lodgment was in August (81) and the quietest months were January and February (36 each). Though 7829 men were ‘declared’ as crew, there are 9662 men named (as some musters only name their crew once but declare more than one voyage), and neither figure will be a true account of the number of men shipped into Liverpool for the year 1827 as there are musters for voyages for earlier years, and some ships did not name all their crew. In 1827 four Musters are lodged for vessels “ Lost” or “Sold” “ Captured” “ Stranded” or “Supposed Foundered” even if in earlier years. Due care has been taken in compiling the 1827 list of musters, but researchers can contact the author for clarification. The handwriting on these old, often worn documents is not always easily decipherable and the names of ships are somewhat ecliptic. Ports the ships visited are often abbreviated, or colloquial terms are used, so please contact the author if you feel something needs correcting or if you have any queries.